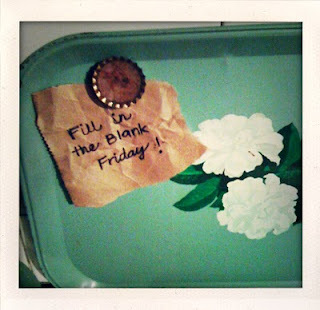 Today is Lauren's Fill in the Blank Friday". YAY! 1. When I'm nervous, I have to pee, if it's the audition/interview kind of nervous. And my voice shakes, which is awful. If it's another kind of nervous, like watching a scary movie, i bite my fingernails. 2. My favorite item in my closet is this gorgeous fancy blue purply dress i own that is flattering on me. I only wore it once, to the theatre's annual ball this year, but i can't wait to wear it again. 3. Taking a hot bath with a novel & a glass of wine or cup of coffee is my favorite thing to do when i need to relax. 4. My favorite childhood memory is when my parent's got me a trampoline. I had wanted one forever & always went to my neighbor friend Sonya's house & we'd jump on hers for HOURS. One evening i was over there & we were jumping on her trampoline & my sister came over & told me that mom & dad said it's time to come home. I was SO mad! I was having so much fun & didn't understand why i had to go home already. I folded my arms & huffed home & then when we got home instead of going inside, we walked around back & my sister covered my eyes. We went into the backyard & she took her hand off my eyes & there was a trampoline in my yard - my dad had just finished putting it together. I was SOOOO EXCITED! I had NO idea, it was not Christmas or birthday time & I just could NOT believe it! 5. Something you may not know about me is that I have no problem with the sight of blood & can watch full blown surgeries without getting squeamish - but get extremely nauseated at just the THOUGHT of a broken bone! 6. A true friend is there for you through the good times & bad times in your life. Never judges you. Always encourages & supports you, unless of course you're doing something stupid. Prays for you & believes in you. 7. Something I hope that people think of when they think of me is that i am someone they could come to for anything & receive love, not judgement. Someone who makes them laugh. Now I hope you will head on over to Lauren's & play along! I love your trampoline story! I felt like I was there watching you be excited, hah! That was probably my favorite activity as a child too, I could jump for hours. All my neighbors had those HUGE trampolines! Have you tried it as an adult?! I did probably 5 years ago, so I was still semi-young-adult and it was the hardest thing!! I was shocked that I couldn't just fly through the air like when I was a kid! numbers 1 and 3 are TOTALLY ME!!! I always have to pee when I'm nervous too! I wonder why that is the reaction to nerves? It doesnt seem to make much sense,...its always so inconvenient! i love your trampoline story! what cool parents to surprise you like that.